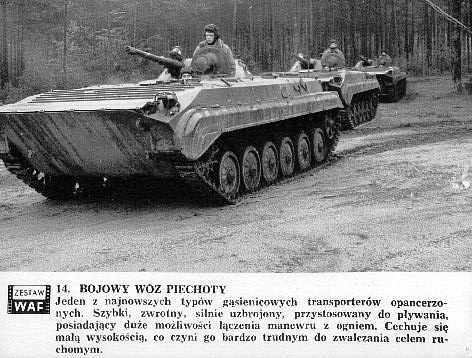 Vehicles used in Polish Army in 1950's to 1980's. Hover over thumbnails to see full size pictures. Some are very large. I suggest viewing this page in full screen (F11 key on your keybord). Still produced by UAZ as a 'Hunter'. This truck replaced the war-time ZIS-5. In the 50's, together with the smaller GAZ-51 this was the general-purose 4-ton truck used by the Soviet and the Polish army. ЗиС/ЗиЛ-151was the first 6-wheel drive Soviet truck with 5.5 ton load capacity. The OT-64 SKOT was a joined venture of the Polish and Czechoslovakian industries alternative to the BTR-60. BRDM stands for “Boyevaya Razvedyvatelnaya Dozornaya Mashina”. Development of this vehicle began in 1954 as an amphbious version of the BTR-40.